For the Lebanese-Mexican family, see Bichir family. The bichirs and reedfish (also called ropefish) comprise the Polypteridae, a family of archaic-looking ray-finned fishes and the sole family in the order Polypteriformes. All species occur in freshwater habitats in tropical Africa and the Nile River system, mainly swampy, shallow floodplains and estuaries. Bichirs are considered the sister group to all other extant ray-finned fishes. Bichirs are elongated fish with a unique series of dorsal finlets which vary in number from seven to 18, instead of a single dorsal fin. Each of the dorsal finlets has bifid (double-edged) tips, and are the only fins with spines; the rest of the fins are composed of soft rays. The body is covered in thick, bonelike, and trapezoidal (ganoid) scales. Their jaw structure more closely resembles that of the tetrapods than that of the teleost fishes. Bichirs have a number of other primitive characteristics, including fleshy pectoral fins superficially similar to those of lobe-finned fishes. They also have a pair of slit-like spiracles used to exhale air, two gular plates, and paired ventral lungs (the left lung shorter than the right). Four pairs of gill arches are present. Bichirs have a maximum body length of 97 cm (38 in). Bichirs are nocturnal and feed on small vertebrates, crustaceans, and insects. Bichirs possess paired lungs which connect to the esophagus via a glottis. They are obligate air-breathers, requiring access to surface air to breathe in poorly oxygenated water. Their lungs are highly vascularized to facilitate gas exchange. Deoxygenated arterial blood is brought to the lungs by paired pulmonary arteries, which branch from the fourth efferent branchial arteries (artery from the fourth gill arch), and oxygenated blood leaves the lungs in pulmonary veins. Unlike most lungfish and tetrapods, their lungs are smooth sacs instead of alveolated tissue. Bichirs are unique in that they breathe using a recoil aspiration. 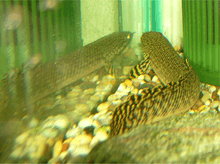 Bichirs are popular subjects of public and large hobby aquaria. They are sometimes called dragon bichir or dragon fin in pet shops for a more appealing name due to their dragon-like appearance. 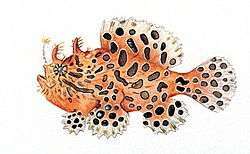 Though predatory, they are otherwise peaceful and relatively inactive, preferring to lie on the bottom, and make good tankmates with other species large enough not to be prey. Bichirs in captivity have life expectancies up to 10 years. 1 2 3 Wiley, Edward G. (1998). Paxton, J.R.; Eschmeyer, W.N., eds. Encyclopedia of Fishes. San Diego: Academic Press. pp. 75–76. ISBN 0-12-547665-5. ↑ Helfman GS, Collette BB, Facey DE, Bowen BW. 2009. The Diversity of Fishes. West Sussex, UK: Blackwell Publishing. 720 p.
↑ Suzuki, D.; Brandley, M. C.; Tokita, M. (2010). "The mitochondrial phylogeny of an ancient lineage of ray-finned fishes (Polypteridae) with implications for the evolution of body elongation, pelvic fin loss, and craniofacial morphology in Osteichthyes". BMC Evolutionary Biology. 10: 209. doi:10.1186/1471-2148-10-209. PMC 3055249 . PMID 20624284. 1 2 Froese, Rainer, and Daniel Pauly, eds. (2011). "Polypteridae" in FishBase. June 2011 version. ↑ Graham, J.B. 1997. Air-breathing Fishes: Evolution, diversity, and adaptation. San Diego: Academic Press. 299 p.
↑ Otero; Likius; Vignaud & Brunet (2006). "A new polypterid fish: Polypterus faraou sp. nov. (Cladistia, Polypteridae) from the Late Miocene, Toros-Menalla, Chad". Zoological Journal of the Linnean Society. 146 (2): 227. doi:10.1111/j.1096-3642.2006.00201.x.